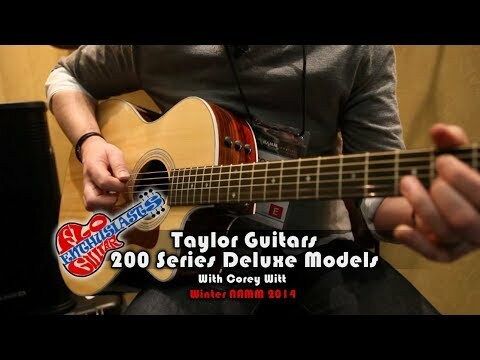 Taylor 214ce Deluxe Natur Venstrehendt med ES2 pickupsystem. Our distinctive 200 Series Deluxe category is loaded with high-end performance appeal. The Grand Auditorium 214ce DLX features layered Indian rosewood back and sides, a Sitka spruce top, a full-gloss body, white binding, Small Diamond fretboard inlay, Venetian cutaway, Taylor Expression System 2 electronics, and a Taylor standard hardshell case. The most versatile and popular of Taylor’s guitar shapes. Its well-defined midrange contributes to a clear and balanced tone. It’s responsive enough for fingerstyle players and powerful enough for pickers and strummers to get a lively response. Think of it as a jack of all trades. Models and specifications are subject to change without notice.